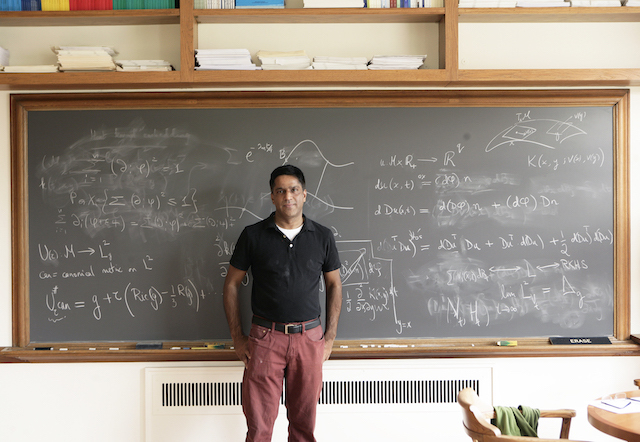 I am a Simons Fellows and a member of the School of Mathematics at the Institute for Advanced Study for the academic year 2018-19. Phase transitions and non-equilibrium statistical mechanics. Integrable systems and random matrix theory. Probabilistic analysis of numerical algorithms. These areas are linked through a common viewpoint. The kinetics of phase transitions and models of turbulence are important examples of dynamical systems in high dimensions. Surprisingly, several numerical algorithms may also be viewed as dynamical systems acting in high dimensional spaces and behave like glassy systems. This approach suggests new questions and (at the technical level) new equations and estimates that I hope will be valuable to practitioners in different fields. My ideals are those of a mathematical physicist. I am constantly amazed by the mathematical beauty of fundamental physical models. Dirac's dictum that all physical principles must have mathematical beauty, seamlessly coexists with Cantor's view that the essence of mathematics resides in its freedom. We have no understanding of why this is the case, but it is a gift of knowledge that belongs to us all. I am also fascinated with the idea that biology can inspire nanotechnology. While self-assembly today is principally driven by experimental advances, it is a promising field for mathematical contributions. I teach classes undergraduate and graduate classes in many areas of applied mathematics. In the past few years, I have developed several new classes. APMA 1940V Spring 2017 and 2018, Topics in information and coding theory. APMA 1710 Fall 2016 and 2017, Information theory. APMA 2200 Spring 2016, Nonlinear dynamical systems, II. APMA 2821X Spring 2016, Statistical theories of turbulence. APMA 2811O Spring 2015, Dynamics and stochastics (random matrix theory) . APMA 1330 Fall 2014, Methods of applied mathematics, III. APMA 2200 Spring 2014, Nonlinear dynamical systems. APMA 2190 Fall 2013, Nonlinear dynamical systems. APMA 0360 Spring 2013, Methods of applied mathematics. I am the associate managing editor for the Quarterly of Applied Mathematics . The Quarterly is published by Brown University and distributed by the American Mathematical Society. We are happy to publish papers in a wide range of areas of applied mathematics, and in many distinct formats. If you'd like to know if your work is suitable, please send me an email. As everyone who is involved in the publishing of mathematics knows, the cost of journals has skyrocketed, while most of the actual work involved in publishing (i.e. writing, editing and even typesetting papers) has been pushed onto authors. The primary purpose of academic publication is the communication of knowledge, not the protection of prestige. For the most part, I will only review or submit papers to low-cost journals, especially those maintained by professional societies such as the American Mathematical Society, the Society for Industrial and Applied Mathematics, or the American Physical Society. After a few years on the boards of Elsevier journals, I am now a signatory of the Elsevier boycott. I am also a contributing writer for The Mathematical Intelligencer . I am always happy to talk with undergraduate students at Brown. The best day to meet with me is on Friday. If you're looking for an undergraduate research project with me, here are my parameters. I have advised several honors theses and I'd be happy to discuss this with you. My typical expectation is that you work with me for at least two semesters, commiting time equivalent to at least one class per semester. I have no other research opportunities for undergraduates. In particular, I do not work with undergraduate students during the summer break, nor do I work with any students who are not enrolled at Brown University. As of Fall 2018, I advise three Ph.D students. If you are a graduate student in applied math or math at Brown, and would like to work with me, please email me. My approach to research is centered on problems, not techniques and each of my students has explored rather different topics. I tend to like "high-risk" problems with a clear scientific source, figuring out a model and the necessary math along the way. I'm looking for students who are curious and driven. If you are a prospective student, and you'd like to work with me, please note that students at Brown are admitted to the graduate program, and are free to choose their advisor, so my "queue" should play no role in your decision to apply to Brown. Student plans often change (as they should) after some time in graduate school. Image courtesy Jessica Wynne .